Free first class shipping on cookbooks and t-shirts through Dec. 20th. 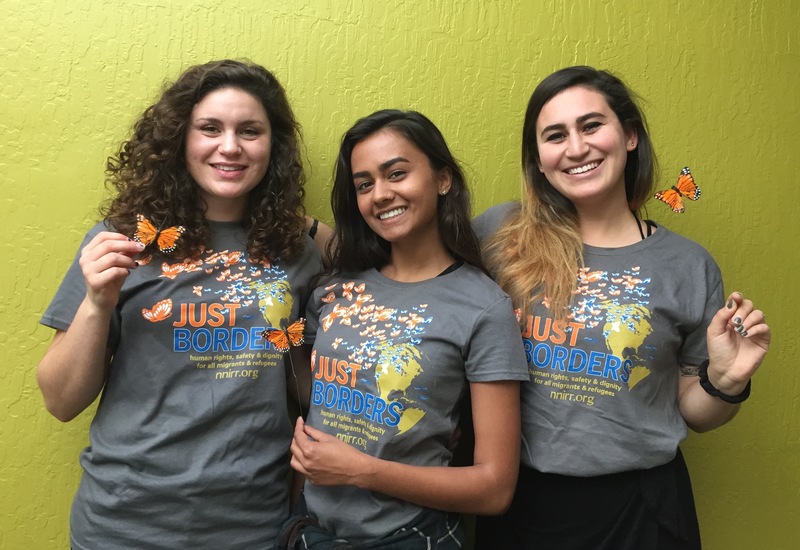 NNIRR's Just Borders raises awareness about the human rights crisis at the border. We are committed to strengthening solidarity with border communities against human rights abuses, to building the case to de-militarize the border, and to ensure that human rights and justice at the border are central to our immigration reform efforts and global migration policies. Show your support with this beautiful t-shirt! Designed by Guillermo Prado of 8point2.com, the image shows the global nature of migration -- including the symbolic monarch butterflies. The tagline reads, "human rights, safety and dignity for all migrants and refugees". NNIRR's Cookbook, on sale for the holidays! Celebrate our migrant communities and favorite recipes from around the world. A timeless and favorite holiday gift for your foodie family and friends (and yourself, of course)! These recipes are as diverse as our migrant communities; they are favorite family/community recipes and are all delicious! Wire-bound with 27 recipes, photos and stories, this cookbook shows how food helps to bridge communities and break down walls of intolerance. These recipes provide both a comfort and a reminder of our humanity. 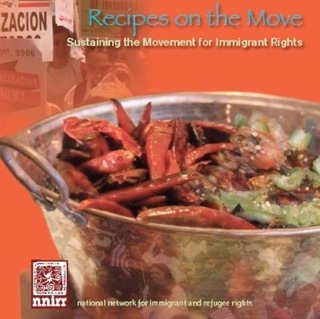 The 70-page collection contains recipes contributed by migrant groups representing 18 nationalities and migrants living among 21 cities across the U.S. and the globe. The more books you order, the more you save! 1-2 books $12.50 ea. | 3 books for $35 | 4 books for $45 | 5 books for just $50! Click here for easy online ordering. Click here to access and print a mail order form. Thanks to a wonderful NNIRR supporter, we have this great wristband on sale as a mini-fundraiser benefitting NNIRR! It carries two timely messages: "Love Knows No Borders" and "No Ban, No Wall"
We know you will want one for yourself and even more to give away to family, friends and colleagues! Great stocking stuffer! Help to spread the word for justice at all borders! $5.00 for one, 5/$20 and 10/$35. Consider an additional donation to NNIRR! You can also give your donation in honor of someone this holiday. Become a monthly or quarterly sustainer! Become a member of NNIRR!